Antagonism of D2-like dopamine receptors is the putative mechanism underlying the antipsychotic efficacy of psychotropic drugs. Positron emission tomographic studies suggest that the antipsychotic effect of dopamine receptor antagonists occurs within a therapeutic window between 60% and 80%(striatal) D2 receptor occupancy. The incidence of extrapyramidal side effects increases above the 80% threshold. However, the novel atypical antipsychotic drug, aripiprazole, occupies up to 95% of striatal D2-like dopamine receptors at clinical doses, and the incidence of extrapyramidal side effects with aripiprazole is no higher than with placebo. The most likely explanation for this finding is aripiprazole's weak partial agonism at D2-like dopamine receptors. 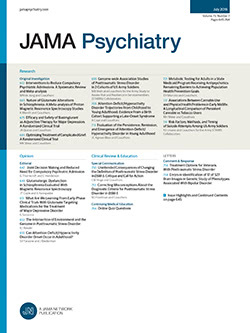 This particular pharmacologic feature characterizes a new class of atypical antipsychotics that does not match the original concept of a therapeutic occupancy window for antagonist antipsychotics. When not involving pure antagonists, it implies a need to adjust the expected receptor occupancy (measured using positron emission tomography) for the therapeutic window.